I need to disclose upfront that I’m biased: I’m a beer lover. And I live in beer-paradise, the crazy state of California. Kicking back with a brewski from a local craft brewer, of which we have over 450, can make even the Fed’s capers less aggravating. But soon that beer-induced smile on my face may dry up. California’s enduring drought that has turned into a water crisis is hitting beer production. Turns out, to get one gallon of beer, breweries use about four to seven gallons of water in their processes, including rinsing of equipment, etc. And there isn’t enough water, or not enough of the right kind of water. California’s craft brewing industry is big. In 2012, according to the most recent data available from the California Craft Brewers Association, the industry contributed $4.7 billion to the economy and employed 44,000 people who earned $1.7 billion in wages. So maybe not the highest-paid jobs, at about 39k per year on average. But it’s a cool industry with hot sales. Overall, the beer industry in the US is sick. Total sales dropped 1.9% to 196.2 million barrels in 2013. Per-capita beer consumption has been dropping relentlessly since 1981, from 26 gallons per year to about 19 gallons. The statistics of a miserable industry. But craft brewers use Yankee ingenuity to create the best beers in the world. And people are buying them! 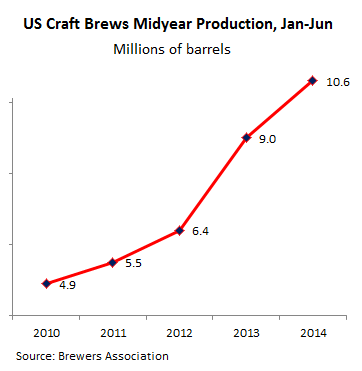 In 2013, according to the Brewers Association, craft brew sales in the US jumped 17.2% to 15.3 million barrels, and exports soared 49%. The world is catching on to our beers! Of the stagnant $100 billion beer market in the US, craft brewers have conquered $14.3 billion, at the expense of industrial brewers and imports, giving them a market share in volume of 7.8% and in value of 14.3%. The difference between the two is largely due to the premium product. The just-released 2014 midyear production data for the January-June periods require a good swig of perhaps an amber for full appreciation of the flavor: they more than doubled in five years! That kind of growth, at the expense of industrial brewing companies and imports, is logical. The beer tastes awesome. The price, though higher, is fair. The product is genuinely American, brewed with the best, often American-grown hop. And breweries are popping up everywhere. Craft brewers range from tiny brewpubs that only sell to customers who walk through the door to California’s largest, Sierra Nevada. In 1975, there was just one of them in the US. By mid-2014, there were 3,040. That said, this number changes constantly and is most likely already wrong. Just because you know how to brew an awesome beer doesn’t mean you get to stick around. And others open their taps even while I’m writing this. 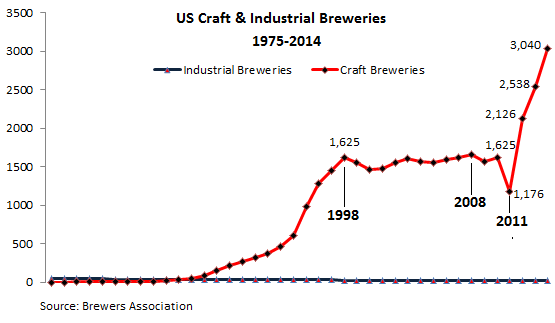 Over those three decades, industrial breweries in the US shrank from 54 to 20, now mostly owned by foreign multinational corporations. In the midst of this frothy expansion drive, with sales booming, and with the world watching in rapt attention what is transpiring in the US beer market, my crazy state of California, the state with the most craft brewers, has been hit by a devastating water shortage. “We are at the maximum growth threshold here in California because of water,” Leon Sharyon, CFO of Lagunitas Brewing Co, told the LA Times. Lagunitas, which makes one of my many favorite IPAs at its Petaluma brewery, less than an hour north of San Francisco, uses about 2 million gallons of water a year from the Russian River that has been reduced to a trickle. Solution for Lagunitas? Heresy! It expanded to … Chicago! Next to Lake Michigan, so that brewery won’t run out of water for a while. Sierra Nevada opened a brewery in Asheville, North Carolina, with plenty of water from the Smokey Mountains. Others are following the same strategy. California brewers are trying to conserve water in their processes. Sharyon told the Times that they’d reduced water consumption by 10% over the last two years. And they’re doing something risky: they’re watering down, so to speak, the water from the Russian River with well water. If the water crisis continues to get worse, water regulators might require them to switch to well water entirely. But there’s a hitch: the water from the Russian River is excellent for beer. Groundwater has an odd taste and is rich in minerals that impact the color and, God forbid, the flavor of my favorite brew. “Grainy and hoppy styles could taste more astringent,” Sharyon explained. The hoppiest of these hoppy styles? My favorite, the India Pale Ale (IPA). So the company spent some money on a filtration system, hoping to get rid of the odd tastes. Bear Republic in Cloverdale, a little over an hour north of San Francisco, also uses the Russian River for its water. But the water district capped it to 8 million gallons a year. “And that’s really affected our growth,” said Master Brewer Peter Kruger. They’d planned on growth of 35%, now cut to 15%. So Bear Republic is also watering down Russian River water with groundwater. It’s installing filtration systems, in the hope of getting rid of the odd flavors. And they’re thinking about opening a brewery somewhere else with a “more stable water supply,” Kruger said. But that too could mess up the taste of their brews. Done that for three years, and it hasn’t worked. “If this drought continues for two, three more years, that could greatly impact the production and growth of our breweries,” lamented California Craft Brewers Association executive director Tom McCormick. Small brewers might be in trouble. They don’t always have the resources to invest in water-conserving equipment. And the water shortage might cut into their booming production. Cismontane Brewing in Rancho Santa Margarita, Southern California, produces only 3,000 barrels a year. Now the water district put in place a voluntary 20% reduction in water consumption, which soon might become mandatory. That’s the fate awaiting beer lovers in the crazy state of California. Your favorite brew might get more expensive, though the price increases will be laundered from the CPI via the government’s inflation reduction machine, called hedonic regression. Its original water is going to be watered down with groundwater. Or it’s brewed in another state. 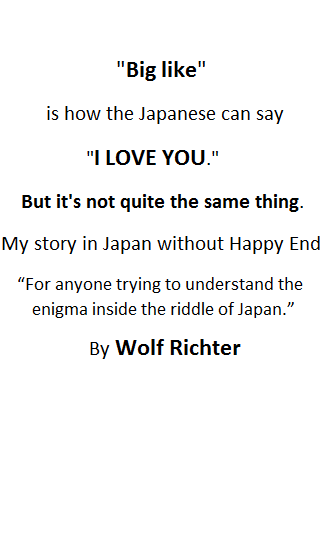 Some of it might go away altogether. And what we have on our hands is a full-blown beer crisis. ← “Reverse Bailout”: Private Banks to Argentina’s Rescue? Israel has three immediate options to meet the problem of increasing water demand and irregular water supply. It can import water from Turkey, at a cost of 80 cents per cubic meter, it could desalinate seawater, at a cost of 52-55 cents per cubic meter, or recycle used water via wastewater processing plants, for 35 cents per cubic meter. If international water markets further develop, Canada would be a central subject of focus, with 20 percent of the world’s freshwater. Canada could export huge quantities of freshwater around the world. Another huge focus would be Alaska. Corporations will be the ones responsible for transporting bulk amount of water to customers. Western Canada Water, Snow Cap Water, White Bear Water, and Multinational Resources were all companies who were planning to transport water by supertankers along the Pacific coast. Yet, they were banned by British Columbia in 1993. “One project was to involve a Texas company prepared to pay for a fleet of 12 to 16 of the world’s largest supertankers (500,000 deadweight tons) to operate around the clock. Under one contract, the annual volume to be shipped to California was equivalent to the total annual water consumption of the City of Vancouver in Canada.”(Who Owns Water, 2002) But the export ban may be reversed, and open the floodgates for bulk water shipments by supertanker down the Pacific Coast again, due to a change of provincial government in British Columbia. Global H2O is another Canadian-based company, which has signed a 30-year agreement to export 18.2 billion U.S. gallons (about 69 billion liters) of glacial water per year from Alaska to China. Global has formed a “strategic alliance” with the Signet Shipping Group, a U.S. company based in Houston, Texas, which has a fleet of supertankers in order to transport the bulk water to China. Each Signet supertanker (50,000 deadweight tons) is expected to carry over 330 million liters (about 87 million US gallons). Global also has a contract with Singapore. “But to supply Singapore on a regular basis,” said Global’s CEO Fred Paley in June 1998, “we are looking at converting single-hull supertankers which the oil industry will be decommissioning” (International Water Marketing, 2001). World Water S.A. is another company that has a fleet of supertankers. This company includes Japan’s NYK Line (Nippon Yusen Kaisha), the world’s largest shipping company, operating over seven hundred vessels. I know I won’t run out of good beer in the UK, but we used to live in Belgium for a while, and we plum ran out of sun. I think they’re already doing that in Wichita Falls, TX, no? It is said in Leeds UK that if you go to any Tetley pub you never buy the beer, that you only rent it. You need to recognize what paradise really is and live in Colorado. Are you going to set a fresh record of grape production for a third year in a row this year? AND HOW CAN THIS BE IN THE MIDDLE OF A DROUGHT?